Check this saxophone exhibition out at the Met if you lucky enough to be in New York City-Adolphe Sax and his creations!!? From Baker Street to Respect; legendary saxophonist performs classic tunes with breathtaking skill. How did Snake Davis get his name? It was coined while watching him perform on stage. It perfectly describes the way he moves; glides with and around the music he creates. He becomes one with his instruments, his enthusiasm is inspiring and infectious. Snake Davis’s performance moves people, it’s passionate, emotional soulful. Starting out busking and in student bars in Leeds, he quickly became known as the saxophonist with “Zoot and the Roots” and the much loved “Snake Davis and his Alligator Shoes”. After briefly setting up home in Brooklyn getting tuition from hot players he started his long career as a solo artist and session musician. To date, Snake Davis has recorded on more than 400 tracks for over 60 artists and the list keeps growing. His tours include Lisa Stansfield, M-People, Eurythmics, Swing Out Sister, B-Witched and (the Japanese rock idol) Ekichi Yazawa. Last year Snake had success with two of his students in the finals of BBC Young Musician of the Year. He was the featured artist on three European chart hits with the dance groups Klingande and Faul & Ad Wad as well as touring in the UK, France and Japan. The New Classic Sax Solos tour see’s Snake Davis step into a 5 piece band (keys, drums, bass and Cutting Crew’s Gareth Moulton on guitar and vocals. So many people love the sound of a great saxophone solo and for good reason. In the right hands sax is so emotional, so passionate; it sings, screams, whispers. An instrumental solo can break hearts, lift spirits, even change lives. Snake performs a myriad of classics, including Baker Street, Careless Whisper, Still Crazy after all these Years, Respect, Yakety Yak, and his own solos from Million Love Songs, Moving on Up, Search for the Hero, and Lisa Stansfields “Change”. What’s more, he also tells you a bit more about them, fascinating facts and insights into the music we already love. 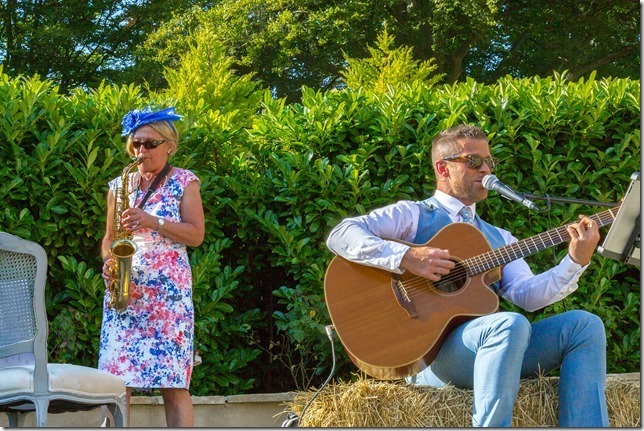 Rosy after a little persuading played saxophone alongside a guitarist the wonderful Louis Armstrong song ‘All The Time In The World’ at her musician son’s James wedding reception.Well done her!! 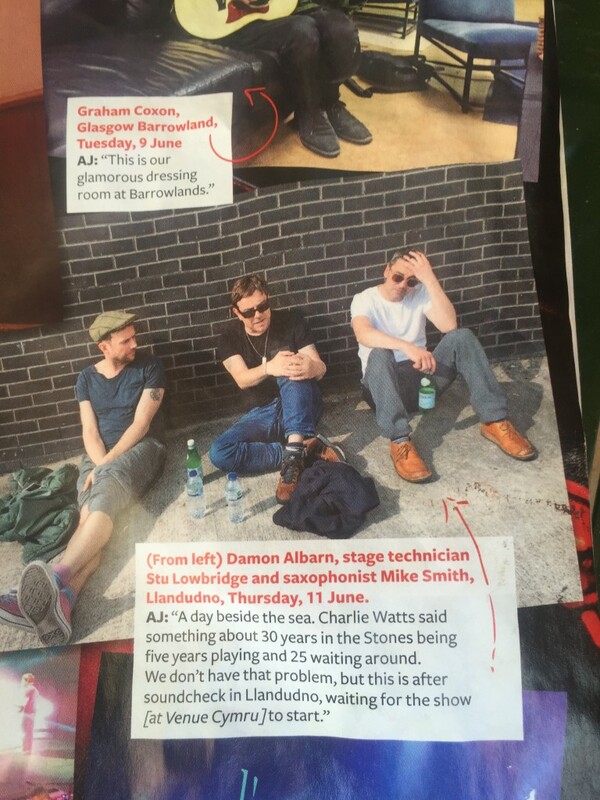 Blur have a sax player Mike Smith -what tracks does he play on and who is he?? 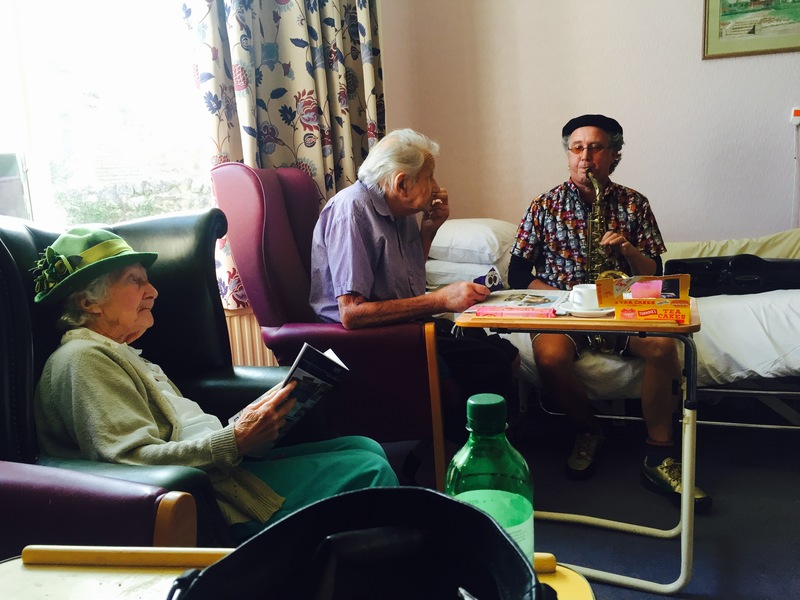 and heres a photof playing sax and the songs getting my mum to sing and engage in her 90th year and me dad to grin too.